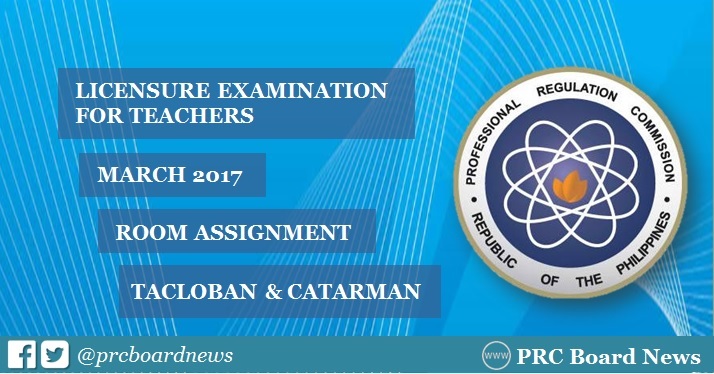 The complete list of room assignment for March 2017 Licensure Exam for Teachers (LET) in Catarman, Northern Samar and Tacloban City has been released online. The Professional Regulation Commission (PRC) advised the room and school assignment for Elementary and Secondary level (Agriculture and Fishery Arts, Biological Science, English, Filipino, MAPEH, Math, Physical Science, Social Studies, TLE and Values Education) takers. For Catarman, examinations will be conducted at the University of Eastern Philippines. Meanwhile, exams for Tacloban will be held in Leyte National High School, San Jose Central School, Rizal Central School, City Elementary School among others. "Use same name in all examination forms. if there is an error in spelling, kindly request your room watcher(s) to correct it on the day of exam," PRC Tacloban advised. On January 24, PRC announced the inclusion of Catarman, Northern Samar as additional testing centers for March 2017 LET in view of PRC Resolution No. 1025, series of 2017. Aside from Catarman and Tacloban, March 2017 LET will be held simultaneously in the cities of Baguio, Cagayan de Oro, Lucena, Puerto Princesa, San Jose (Occidental Mindoro), Cebu, Davao, Iloilo, Legaspi, Tuguegarao, Rosales, Tacloban and Pagadian.